A group of seven New England Patriots fans have filed suit against the NFL, Commissioner Roger Goodell and Patriots owner Robert Kraft in an attempt to get the league to restore the first-round draft pick taken from the team as part of the punishment for last year's "Deflategate" scandal. The civil lawsuit, filed Tuesday in U.S. District Court in Massachusetts on behalf of all Patriots fans, seeks an expedited temporary restraining order and preliminary injunction. It also seeks the return of the Patriots' first-round pick in the April 28 draft and attorney's fees. The complaint claims the NFL made an "arbitrary and capricious" decision to revoke the pick in this month's draft even though there is no proof the team deliberately deflated footballs in the Jan. 18, 2015, AFC Championship game against the Indianapolis Colts. According to the complaint, the league and Goodell relied on "false premises and biased 'investigations'" in handing down punishment, which also included a $1 million fine and a four-game suspension for quarterback Tom Brady. Brady's suspension remains under appeal. The lawsuit claims the NFL violated the Massachusetts Consumer Protection Act by "wrongfully revoking the Patriots' 2016 first round draft choice." It says Kraft could have fought harder to restore the draft pick, "but he chose his fellow billionaire owners above the Plaintiffs and fellow fans." 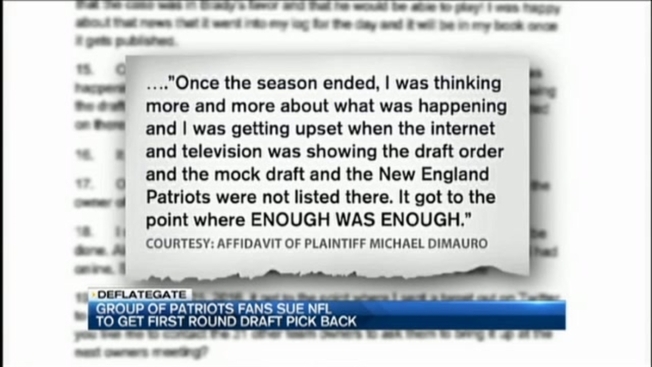 "Plaintiffs have dealt with embarrassment, ridicule and depression due to the rest of the country who is jealous of the Patriots 'piling on' and criticizing the Patriots and their fans for being 'cheaters,'" the suit says.